Construction: 26 poles. No earth on the axis, excellent! Bearings are sealed cartridges. User serviceable: No, unless you make your own tools. The first time I tried the hub (installed in my Koga-Miyata World traveller), I got the feeling there was something wrong with my tyre. Did I pump it up too hard? I thought this might be the cause as I installed the SON28 just after a test with various hand pumps, and the front tyre was a cross tyre, a bit worn actually and altough it gives a slight hum when cycling quickly over asphalt roads, there really isn't a difference to standard tyres. Now I had the feeling as I felt knobs on the tyre. This turned out to be the hub dynamo... The Edelux headlamp was set to S (sensor) and lit despite plenty of surrounding light (and of the bad points of the Edelux). Switching the sensor ring on the lamp to 0 (off) removed the feeling. So, it was the hub dynamo, not the tyre. So, it gives off noticeable vibrations when the lamp is on, something I had not felt before with a mid-class Shimano hub dynamo (but on a bike with a fairly heavy sprung front fork which will influence what you feel because it's heavier, see for more on that elsewhere). I only notice these vibrations when riding on smooth asphalt. The feeling can be described as riding on knobbly tyres but also with the feeling one can get when the chain is not quite perfect on the cogs, that gives a small vibration and I occasionally get that on my road bike (very briefly). The vibrations are largest at speeds of about 23 to 30 km/h. This is not good for me, as those are the speeds I ride at when cycling comfortably. At more than say 35 km/h it gets a bit less it seems, but allthough I ride 30+ occasionally at night, it's usually around 30 km/h, sometimes mid 20s when I want to relax, so always with those vibrations. At about 42 km/h and more the vibration gets back again. Not too bad but it's not nice at these speeds! But as these speeds are uncommon (unless you ride in an area with large hills), it's not really an issue in deciding on which hub dynamo to buy. Op rough, poor quality asphalt (we sometimes have that around farms) I don't notice the vibrations, or not much, because you get so much vibration from the road that vibrations caused by the dynamo hub don't stand out any more, i.e. they are effectively masked... The same goes of course for cycle paths made from tiles. So if you live in an area where there are no quality asphalt roads, the vibration issue need not be an issue for you in choosing a dynamo hub. Addition 2011-3-14: Tightening the skewer as was suggested to me does not remove the vibrations. This has nothing to do with the problem generally, and if the skewer wasn't tight enough, the SON28 would rotate around its axis and start pulling the cable to the headlamp taut. 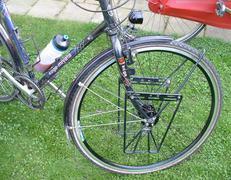 The skewer was tightened quite a bit in all tests; the SON28 simply has larger vibrations than the other dynamo hubs. The vibrations also don't disappear in those other hubs by tightening the skewer there. What can be an issue in noticing dynamo hub vibrations is the headset: If it's loose vibrations will become more noticeable. Note that the SON28 tests were all done with a properly tight headset so that wasn't an issue. The reason for the strong vibrations is explained on the main page and elsewhere, and it's due to the front fork not being completely stiff, the magnet strength plus induction and the low number of poles of dynamo hubs. This is also, as I said since the inception of these webpages, why I would like to see a rear wheel dynamo hub which would improve matters... See for more on the problem of vibrations: Theory for dynamos. It's just a slight vibration of course, but it annoys me to no end. I find it almost inconceivable that I've never read about this in tests (magazines) or experiences on the web (note, I should rewrite this, I wrote it in 2008 ;-)). It looks like nobody looks at these things critically. It's possible this can be eliminated with heavier tyres (the bigger rotating mass means the jolts from the magnets will have less effect, but will that be enough? ), but I really don't want that and it means you shouldn't use the SON 28 at all in a road bike wheel (for winter use, or commuting)! The relevant comments in which the vibrations are mentioned, appeared in November 2007, after I had gathered information from various places on the qualities of the SON 28 dynamo hub compared to e.g. Shimano DH-3N71, (this was ca. mid 2007, it took a while before I actually bought one mid 2008). Positive points: Works under all conditions (compared to a sidewall and roller dynamo I mean), doesn't need maintenance, it was the hub dynamo with the highest efficiency until the SP series 8 arrived. Oh yes, and a pressure equalising system that should prevent water getting sucked into the hub (when taking a bike from a warm environment such as your house or a heated garage into the cold), but this can fail as everything can fail. Negative points: I think it looks rather crude (compared to the Shimano DH-3N80 or Alfine, and the SON20R...). Expensive. Vibrations in the handlebar, flickering light at low speeds (say 5 km/h, this is something almost all hub dynamos have in common). Other hub dynamos have vibrations too, but with the SON 28 they are much more noticeable. With the SON28, you can feel those vibrations even when the light is off, allthough so much less than with lights on, that it didn't bother me much at first. After a while they were beginning to annoy me even in that case, at which point I decided not use the SON28 any more and I bought a Shimano DH-3N80 to replace it. Note that the SON28 is the only dynamo hub I tried with which I can feel the vibrations with lights off. The issue of vibrations may be less of a problem on your particular bicycle, it depends on resonating frequencies of your front fork with wheel (including tyre), and wheel + tyre mass. I would not be surprised if with carbon fiber or titanium forks the vibration issue is less (I will test this later). I bought the SON28 as I wanted to get the best, but actually, after doing my own tests the SON28 wasn't the best if you consider more facets than just efficiency, and that really disappointed me. So, I do not recommend the SON 28 because of the negative points. I'd like to see a better version of the Renak (geared hub dynamo, no flickering and can be switched off completely), or even a spindle version (even better perhaps would be a complete redesign of the bicycle: rear-wheel dynamo, with gears in the bottom bracket). But at the moment (this was written late 2008) I would choose a Shimano. I'm basing this on my experience with their mid-class dynamos, but this is also true for the recent DH-3N80 (Shimano's best hub dynamo) which I tested since late October 2008. 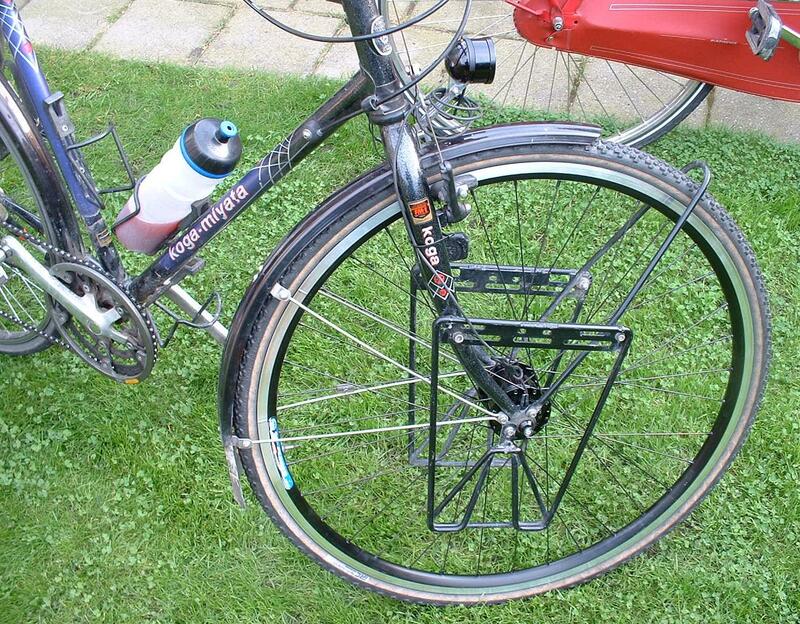 Note that using the SON28 and other dynamo hubs in some other bikes gives the same result. The exact resonance frequency may vary but it has the strongest vibrations of any dynamo hub I tested, there is no way around it. And in yet other bikes there's no resonance because the frequency of hub jolts is not a resonance frequency of the fork (with given tyre mass etc. and in a speed range that you ride in). This means on some bikes you may not notice the vibrations. I also wrote that in lots of places. What my review says, is that if you have no earlier experience of a dynamo hub, then a SON28 could well be a bad choice. The safest choice is then one with the lowest strength vibrations. The SP hubs are best. They will be best in all bikes as the strength of vibrations is caused by the strength of the jolts. Calling my tests subjective as I read in various places in particular because of my SON28 and Cyo RT reviews is interesting, but flawed. Here people seemingly cannot handle the fact that what they bought I dislike. This is a well known phenomenon where people feel the need to defend their purchases, which clearly shows in many such criticisms. Proper criticism of my reviews I have not read anywhere. I dislike the SON28s for objective reasons. The way I write my conclusion may be influenced by my annoyance about having bought what was recommend as the best (SON28) and a lamp that B&M fooked up with their new reflector with hotspot (the Cyo R/RT), but that changes nothing about the fact that my conclusions are based on objective points. If you want to argue about it, you can send an email, but I suggest you read the rest of my website first. Especially the section about invalid arguments and the section on vibrations caused by dynamo hubs. Note finally that loose hub testing would be nice coupled with in-bike testing, but precise measurements are not required, which someone claimed here. So no, my tests are not "as subjective as anyone else's". I know physics, and I know enough about psychology. I test a lot, with different bikes, tyres, electrical loads and I know the relative strength of vibrations is something that works. If you have different experiences with hubs than me, then I want to know about it and see how that is. I am not interested in any "you are subjective because" followed by an implication that I don't properly test or don't know what I'm talking about. Such people seem to be always SON28 owners who just can't stand my criticism of that hub. Well, tough!